The Clarets were beaten by Rotherham United at Millmoor in the old Second Division when Arsene Wenger took charge of the Gunners for the first time 22 years ago. Burnley, under the guidance of now Minnesota United head coach Adrian Heath, could only dream of playing Arsenal when Mark Druce's first half strike for the Millers subjected them to a sixth defeat in their opening 12 games that term. 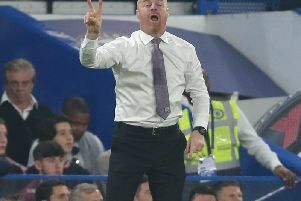 Incredible, then, that on the Frenchman's final home game at the helm, Burnley would go in to their penultimate fixture of their fourth Premier League campaign just three points behind their opponents. Wenger, who saw off Blackburn Rovers on his bow, thanks to Ian Wright's double at Ewood Park, was welcomed on to the Emirates pitch to a guard of honour, recognition of his achievements since moving to Islington from Nagoya Grampus Eight. Though the trophies dried out somewhat, and the Frenchman's revolutionary influence somewhat wained over the final decade, Wenger will depart as a three-time Premier League champion boss, adding a managerial record-breaking seven FA Cups to that collection. This was simply a celebration of Wenger's success, a salute to the man that brought about change to the English game. Unfortunately for Sean Dyche, who has never taken a point off Wenger in six top flight attempts, with an FA Cup defeat to boot, the party soon turned in to a parade, a procession of all that the 68-year-old 'statesman' has created. The home side took the lead just before the quarter-of-an-hour mark Alexandre Lacazette played the ball in to the six-yard box where strike partner Pierre-Emerick Aubameyang stole in between James Tarkowski and Matt Lowton to slide the ball home. Burnley's afternoon in Islington would get even worse midway through the half when in-form forward Ashley Barnes was forced off with a suspected dislocated shoulder, sustained in a collision with Granit Xhaka. After Henrikh Mkhitaryan went close twice, guiding the ball over from Lacazette's cross on the first occasion with his deflected effort palmed away by Nick Pope afterwards, Arsenal doubled their lead in first half stoppage time. Lacazette's entry in to the penalty area was untracked and the Frenchman, signed from Lyon, was allowed to side foot Hector Bellerin's delivery beyond Pope at his near post. Arsenal couldn't be contained after the break, the game quickly turned in to an exhibition, and they were rewarded with their joint biggest league win of the season, equalling that against Huddersfield Town in November. Sead Kolasinac fired the ball across Pope and in to the far corner to make it 3-0 after jack Wilshere had manufactured space for himself magnificently in the middle of the park. Mkhitaryan went close again soon after when, having cut on to his left boot, the Armenian international looked to thread the ball in to the corner but, with Pope at full stretch, the effort travelled beyond the upright. The home side's fourth was characteristically suave and cutting, carrying all the power and penetration we've come to expect of Arsenal over the years. Aubameyang was the man to receive the ball inside the penalty area and the former Borussia Dortmund striker's pass was rifled in to the roof of the net by Alex Iwobi. The Gabon forward then grabbed his second when flicking the ball past Pope from Bellerin's delivery to complete the scoring. Substitute Danny Welbeck almost added a sixth on a historic day for the Gunners but his first time attempt from the edge of the box clattered the woodwork. Football will be sad to say farewell to Wenger but maybe Dyche will get more luck out of his successor, whoever that may be.